Ah, the delights of sickly sweet cordials and syrups. 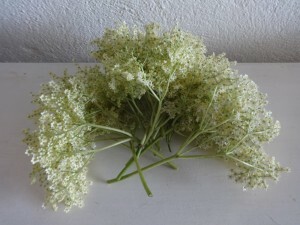 So refreshing and timed perfectly for elderflower season. Every sip takes me rushing back to my childhood and our favourite Australian tipple: GI cordial. Modern readers will think that GI stands for Glycemic Index and it involves eating healthily and making smart food choices. Hah! When we were growing up we were subjected (most willingly) to the other GI. GI cordial. I don’t want to waste time actually looking up the facts; that will spoil the memory. But it was lime green and for some reason called GI. I suspect it was leftover stock from the US Army based in Guam in the Vietnam War. Man, it was powerful stuff. Particularly if responsible adults didn’t notice how much you were pouring into your plastic cup. Dilute it with water? I swear if you drank it neat then you would be buzzing from a serious chemical overdose all day. I dare not ask now what was in it. I just picture us at Werribon, on the farm, a posse of siblings and cousins, downing our morning glass. Mum would open the kitchen door and this whirring rush of buzzing kids would just spring out to the paddock and not be seen for hours and hours and hours. Smart mother. These days. Older and wiser. I make my own. And keep it simple. I always fall on cordial or syrup recipes in my reading and find that way too many are way too sweet. I’m obviously making amends for my misspent youth. You need to think about how you drink these cordials. If you make them and then drink them over the course of a week, I don’t think you need to over sweeten them. They can just live in the fridge to preserve them. And if you want to make them but store them, keep the sugar ratio low, but add a teaspoon of citric acid at the very end. You want to taste the fruit, not just get the sugar rush. My ratio is this 6:3:1. It works better in metric. This works brilliantly for raspberries, blackcurrant, gooseberries (a tart delight), jostaberries, strawberries, red or white currants, mulberries and even blackberries. Put the fruit into a heavy saucepan, add the sugar and water and stir like mad as it comes to the boil. Turn down the heat and stir for a few minutes while you prepare the bottles and the fiddly little funnel to fit in the top. Use a potato masher if you need to break up the fruit. Turn off the heat, add the teaspoon of citric acid if you wish, stir, strain and pour into a sterilized bottle. Cool and leave in the fridge. You will find this a useful way of preserving the fruit when you have a glut. And there’s no need to carefully pick off stems or bits of leaf. My favourite cordial asks for a slightly longer method so I have set it out below. And yes, it breaks my low sugar ratio rule. 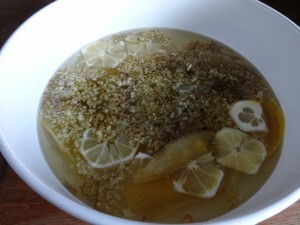 Elderflower syrup. 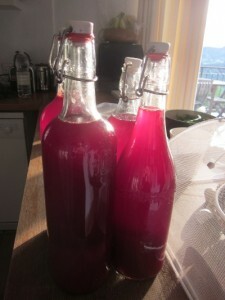 Sirop de fleurs de sureau. The first signs of spring has to be the elderflowers coming into bloom. And it is my first cordial of the year. This event can happen any time here from late April to late May. And if I time it well I can go down to visit Andrew – two hours’ drive south – and pick the early flowers. And if I miss out, then go and visit Leslie and Teo, forty five minutes west and a few hundred metres higher – and pick theirs. 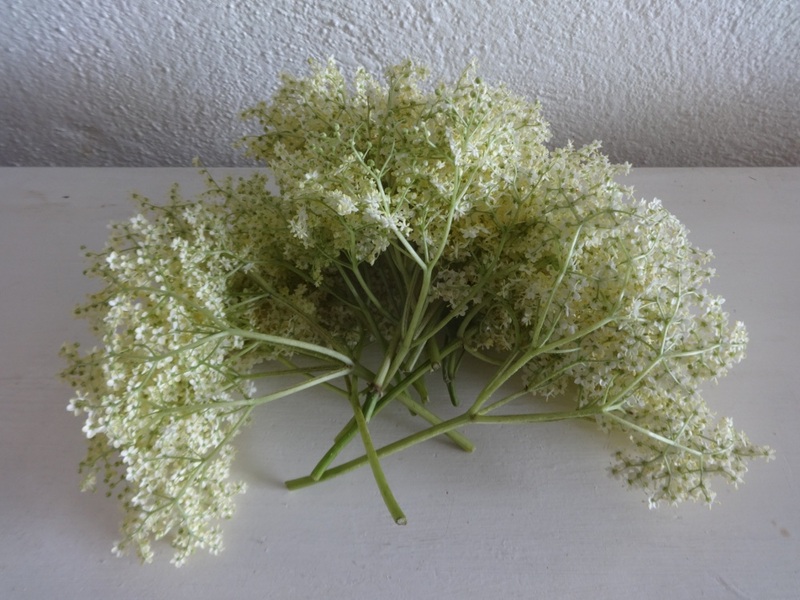 This gives me about three months of elderflower cordial season. And if you are really pressed for time, you can freeze the flowers whole in a plastic bag and make it at any time of year. Shake the heads well to remove any bugs. Place them into a deep bowl with the lemon zest and slices. In a saucepan bring the water and sugar to the boil, stirring until the sugar dissolves. Poor this over the elderflower and lemon. Add citric acid. Stir. Leave 24 hours, covering with cling film to keep out curious teapsoon tasters and bugs. I leave it on the kitchen bench but it can go in the fridge. Strain into sterilized bottle then refrigerate.